The Toronto Time Capsule launched in February, 2015. Presented by Metroland Media Toronto "a growing collection of news stories, photographs, genealogy resources and columns from local historical experts are all dedicated to Toronto's rich and colourful history." I contributed eight short monthly columns to the genealogy section which can be viewed at InsideToronto.com. 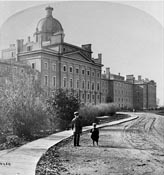 Image: Lunatic Asylum, Queen St. W., s. side, opposite Ossington Ave. Photographer William Notman, Montreal, 1868. Courtesy Toronto Public Library F 114. Image: Brown's Toronto City and Home Directory 1846-7. Courtesy Toronto Public Library. Image: Courtesy Toronto Public Library. Image: Jail (1799-1827), King St. E., s. side, at Leader Lane. Watercolour, William James Thomson, 1888. Courtesy Toronto Public Library JRR 711. Image: Land Petition for Thomas Mathews, Newark, 1797. Source: Library and Archives Canada/Executive Council of the Province of Upper Canada fonds/Volume 329/Bundle M 3/Petition 32/Microfilm reel C-2192. Image: Lots 17 & 18, Concession 3, Clinton Township Papers. Source: Archives of Ontario/RG 1-58/Microfilm MS 658 reel 84. 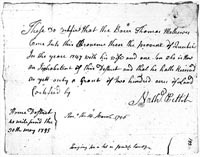 Image: Certificate attached to Land Petition for Thomas Mathews, York, 1795. Source: Library and Archives Canada/Executive Council of the Province of Upper Canada fonds/Volume 328/Bundle M2/Petition 132/Microfilm reel C-2191. 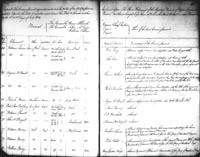 Image: Heir and Devisee Entrybook of Commissioners' Reports 1803-1804, Register C. Source: Library and Archives Canada/Heir and Devisee Commission Minutes and reports submitted to the Executive Council of Upper Canada/RG 1 L5/Volume 82/Page 31/Microfilm reel H-1148. Webpage design built using Microsoft Notepad by Lee Dickson. Proof read and edited by Jill Lennox.